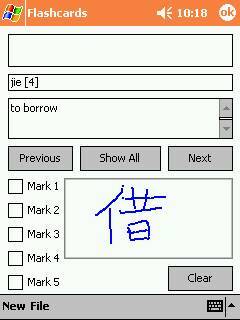 Chinese Reviewer is a combination flashcard program and a Chinese-English dictionary. This version comes with a large database of Chinese characters (chapters 1-15 of Integrated Chinese); as time progresses, the database will be expanded even more to include more characters. Please visit the Chinese Reviewer website at http://www.ocf.berkeley.edu/~mlyang/chinesereviewer for updates. I hope that you enjoy using it as much as I enjoyed writing it. Please feel free to email me with any bugs or suggestions. Chinese Reviewer runs on the Pocket PC 2002 platform only (it does not run on later versions of Pocket PC), the ARM processor, and requires approximately 6.5 megabytes of storage space in memory: 350k for the application and 6 megabytes for the mingliu font library. The installation requires the target Pocket PC to be connected to the computer via Microsoft ActiveSync. Chinese Reviewer requires that the mingliu font library be installed on your Pocket PC. You may already have it installed on your Pocket PC (chances are you don't); there are links to distributions of Chinese Reviewer below that include and don't include the mingliu library. You can download Chinese Reviewer here. Unzip “ChineseReviewer1.1.zip” to your desktop computer and run “Setup.exe.” During the process of the installation, your Pocket PC may prompt you to overwrite some system files. Select “Yes to all” to overwrite the files (if you know what you are doing, you can selectively decide what to overwrite or not; the system files in question are related to ActiveX dll’s for embedded Visual Basic controls). 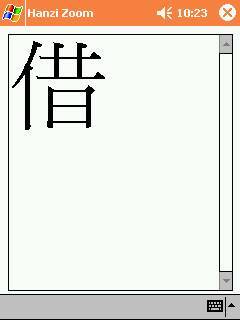 You will also need to install the mingliu font library on your Pocket PC if you have not already done so. Copy mingliu.ttf to the Windows/Fonts directory to your Pocket PC to install them. Check back to the Chinese Reviewer webpage for updates to the program and character database. Please note that the characters that I will be adding to the database will mostly be from the set of characters used by first year students at UC Berkeley Chinese courses. 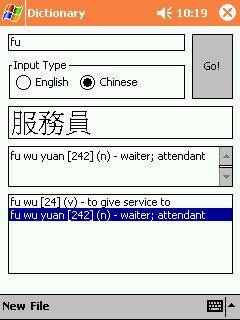 If you want to add any other characters, you are free to do so yourself by modifying the database (chinesereviewer.cdb – you can convert it from Pocket Access database to a Access database using ActiveSync). If you would like to make your character database available to the online community, please let me know and I can place a link to it from the website. I make no warranties of fitness for Chinese Reviewer (implied or otherwise) and will not be held responsible for any damage through the use of Chinese Reviewer. Chinese Reviewer is distributed freely, but the author retains the rights to the program, source, and database. You are free to modify the database to add more characters for use with Chinese Reviewer. · The first three fields display the Hanzi, ping ying, and English definition. You can control which ones are displayed in the configuration (discussed shortly). · You can change flashcards by clicking the Next and Previous buttons. You can also change the flash cards by pressing the right and left directional keypad buttons. · The drawing area can be used for practice of Chinese characters. The drawing area is cleared when Clear is clicked or when the flashcard changes. · Clicking the OK button will exit the program. · Note: Mark 1-5 are currently unsupported. In the future, these will allow you to selectively choose which cards to display as flashcards depending on your configuration. 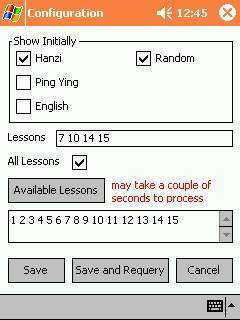 · Clicking the Show All button will display all three fields (Hanzi, ping ying, and English definition). · You can also show all the fields by pressing the up directional keypad. · Clicking on the Hanzi field will zoom in on the Hanzi character, allowing for easier viewing of the character. · You can also bring up the Hanzi zoom by pressing the down directional keypad. · You can exit this screen by pressing the center (“action”) directional keypad. · Clicking on File will bring up the menu. 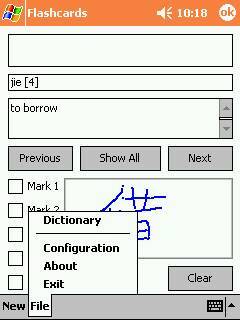 From here you can access the configuration for the flashcard program and the dictionary. · Note: The New menu option is currently unsupported. · This figure is a summary of the keypad functionality for the flashcard portion of the program. 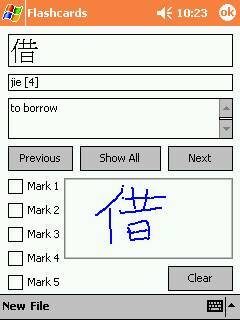 · The checkboxes for Hanzi, Ping Ying, and English determine which fields will be shown initially when a new flashcard is displayed. · Selecting the Random checkbox will randomize the flashcards. · Selecting the All Lessons checkbox will add all characters to the flashcard. · If the All Lessons checkbox is not checked, the Lessons textbox will determine which characters will be displayed. Several lessons’ characters can be chosen by entering multiple lessons in the Lessons textbox, separated by spaces (e.g. 7 10 14 15). · Clicking Available Lessons will query the database for all the available lessons in the character database (warning: this will take a couple of seconds to complete). · Clicking Save will save the current set of options, but will not requery the database (i.e. will not get a new set of word from the database). Save and Requery will save and requery the database. Cancel will exit the configuration without making any changes. · The dictionary can be queried by typing the search sequence in the input textbox, selecting the Input Type (either English or Chinese ping ying) and clicking Go!